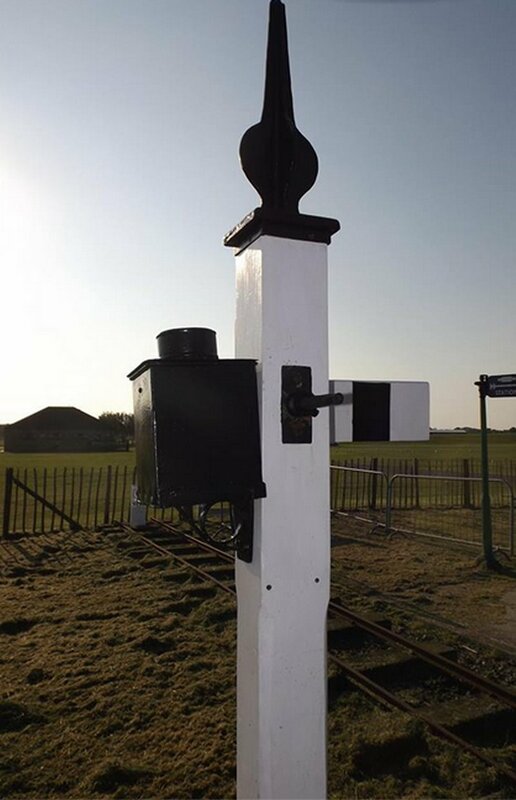 It seems it is the UK's two-foot gauge railways that are taking the initiative in the preservation and restoration of Lancashire and Yorkshire Railway signals, and an example of a LYR tall siding signal can be found at the Skegness Water Leisure Park station of the Lincolnshire Coast Light Railway. The first flowering of the Lincolnshire Coast Light Railway was at a site at Humberston, south of Cleethorpes, where it operated from 1960 to 1985. The line transported holiday-makers from a bus terminus to the Fitties Holiday Camp and Humberston Beach. The railway has origins in the network of narrow gauge railways which before the development of modern roads, served Lincolnshire’s potato growing industry. The largest was the Nocton Estates Light Railway, seven miles south of Lincoln. Its track and rolling stock came from the trench railways built by the British military in the First World War to take troops and munitions to the front lines. When the Nocton system was due for replacement by improved roads, a group of railway enthusiasts decided to preserve some of the equipment and convert it for use on a passenger carrying line. Jim Smith notes that the LCLR obtained a 3-arm post with most of the bits in place in the 1960s. It came with some fencing, station seats, one of which was marked 'Morley', and a single shunt L&Y signal. [Morley was opened by the LNWR on 15 September 1848, and renamed Morley Low on 30 September 1951. It is on the Leeds - Mirfield line]. The single signal was erected, and the 3-arm was reduced to a single arm and also erected at Humberston. The pair appear in photographs of the site. In 1970 Ken Hartley provided a Guide Book for the LCLR, and this states that 'ex-L&YR "dwarf shunting signals' were erected in 1962 on the original line at Humberston. In 1966 the line was relocated 30 yards to the south, which gave it a longer run, and this process was completed in 1969. Tere is no mention in the Guide of the signals being relocated, but a photograph in the centre spread shows 'Jurassic' leaving North Sea Lane Station and passing both signals. One would appear to be the advanced starter, and the other the in-bound Home signal. The signals remained in place and in use until the line closed in 1985. At closure there were 2 L&Y; 1 GNR miniature somersault; 2 LNER upper quadrant shunt and a fog signal repeater. At the closure it was thought that the line would not reopen and Jim Smith asked for and was given some parts from the 3-arm signal. He had the bearings, the stop block, the centre pin, a push rod and a spectacle plate. He bought a piece of elm 12' long and built-up the signal. Jim and some of his students made the entire lamp, the lamp bracket and the finial. Jim notes that the students got to learn to use an oxy-acetylene cutter and electric arc welding. Jim assembled all the parts and erected the signal in his garden. Subsequently he moved house and it and the garden railway was also moved. A homemade signal lever and pulleys with wire operated it round the edge of Jim's garden. After a prolonged period of storage, the Lincolnshire Coast Light Railway was re-born at Skegness Water Leisure Park, which is about 2 1/2 miles to the north of Skegness. With the LCLR now established in its new home at Skegness Water Leisure Park, Jim felt it was time to erect the signal at its real home. Copyright Lincolnshire Coast Light Railway, all rights reserved. Replica LYR tall siding signal as seen on the Lincolnshire Coast Light Railway at its Skegness Water Leisure Park Station. Copyright Michael Newbold, all rights reserved. Rear of the replica LYR tall siding signal as seen at the Lincolnshire Coast Light Railway at its Skegness Water Leisure Park Station.